Print these coupons or show your California Security Representative the coupons on your mobile device to receive the discounts. We will also match any ADT coupons or online offers you have. "after getting quotes from other companies....by far, this was the most comprehensive package for the money"
"When looking for a security system, I was recommended to Bill Wood & the staff of California Security Pro by a local locksmith. I was not disappointed in their price or service. Bill was a fantastic consultant & made sure that we got everything we needed. He never tried to push us on things & evaluated our home in a fair & intelligent manner. I met Bill after getting quotes from other companies & by far, this was the most comprehensive package for the money. Additionally, their installer was quick & efficient & even gave me his cell number to call if I had any concerns or questions after he completed setting up of the system. 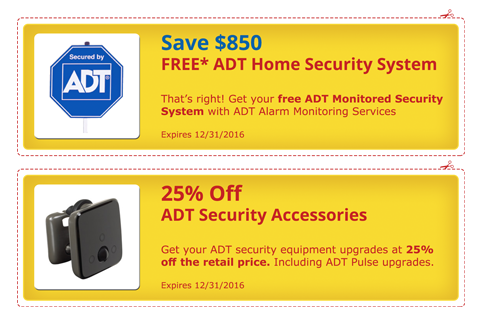 Don't be fooled by those ADT Coupons you get in the weekly flyers either. Not all ADT companies are the same & Bill will give you better deal than any out of state company offering ADT service. California Security Pro is a local NorCal company that is an ADT authorized provider that employs local folks. Highly recommended!" "Price was much lower than the competition. Service was exceptional." "The other Yelp reviews don't lie. This company really is willing to do whatever it takes to get you the right service to match your budget/needs. From the person who answered the phone, the rep Kyle, to the installer, I felt like they wanted to get me exactly what I wanted. I had contacted two other companies that I was familiar with. What a waste of time. I was looking for a system for my client and possibly my own home. The other companies seemed confused by taking two orders at once. Not only that, it would take up to three weeks to get the systems installed. Cal Sec Pro offered to get BOTH jobs done within 3-5 days. Price was much lower than the competition. Service was exceptional. And I wouldn't hesitate to refer them to my most discerning real estate clients."